The data shows that health and social work is clearly the most popular sector for apprentices, making up 27 per cent (121,680) of all starts in 2016/17, up from 23 per cent (104,170) in 2012/13. It was also the most popular for higher apprenticeships, making up 43 per cent of all higher apprenticeship starts in 2016/17. The data also shows that traditional ideas of gender roles are still holding strong among apprenticeships. In 2016/17, 88 per cent of all starts in the construction sector were by men, and construction, manufacturing and wholesale and retail trade between them accounted for 40 per cent of all male apprenticeship starts. In comparison, 85 per cent of all starts in the health and social work sector were women, which accounted for 43 per cent of all female starts. Since 2012/13, the number of female apprenticeship starts have dropped from 244,380 to 238,290, but men have increased from 205,880 to 211,530. 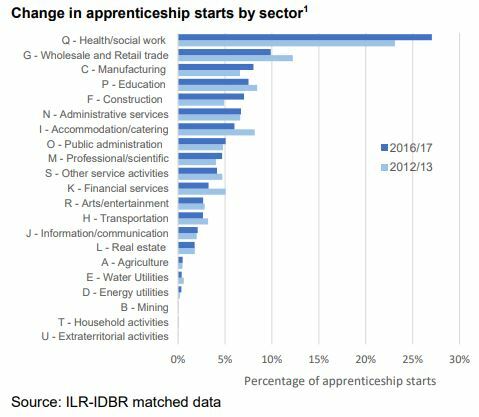 Although large employers (those with 250 or more employees) made up just nine per cent of all employers with apprenticeship starts in 2016-17, 46 per cent of all apprenticeship starts were at large employers. This is a decrease of three per cent from 2012/13. Small employers (less than 50 employees) took on 37 per cent of apprenticeship starts, with medium sized employers (50-249 employees) the least likely to have an apprentice, taking on just 17 per cent. Heath and social work is more likely to be dominated by older apprentices, with 66 per cent of its starts being from those aged 25 and over in 2016-17. The youngest apprentices, under 19s, made up over half (54 per cent) of those in the ‘other services’ sector, while 42 per cent of starts in public administration and defence were from apprentices aged between 19 and 24.